Its not easy to find places where the people are still in touch with their roots…Where the traditions and customs are kept alive… Where they still work the land and grow their own olives and almonds…meet Nevada, a beautiful, unspoilt cluster of four Moorish villages deep in the Alpujarra mountains in Granada, is one such place. Set against the stunning backdrop of the Sierra Nevada National Park, the area provides a glimpse of a traditional, rural, Andalusian lifestyle… and is home to a very special project. The local inhabitants have come up with a novel way of bringing both tourism and culture to the area. They have built a beautifully crafted open-air theatre around an ancient, cobbled corn-threshing circle using traditional building methods and locally-quarried stone. Inspired by the magical Minack theatre in Cornwall, visitors to this theatre can enjoy a truly unique experience: watching amazing theatre in stunning surroundings by night and, of course, exploring the area, enjoying the local food and wine, and learning about the local customs by day. One of the most striking characteristics of the project, is without doubt, the overwhelming support it has garnered, not just within the local community but also further afield. The local people are thrilled to be breathing new life into the corn threshing circles that until very recently played a central role in village life, and for the younger generations (in the face of growing unemployment and a rural lifestyle under threat) the theatre offers the chance to take the reins of their future into their own hands. The project has gained the support of all kinds of people, from film director Fernando Colomo, to bestselling author, Chris Stewart, as well as international stars like Russell Crowe and Leonard Cohen. It has also been endorsed by the prestigious Lorca Foundation and has won a sustainability award. For additional information and to support the Un Teatro Entre Todos project. Kids getting bored and fractious in the back of the hire car? 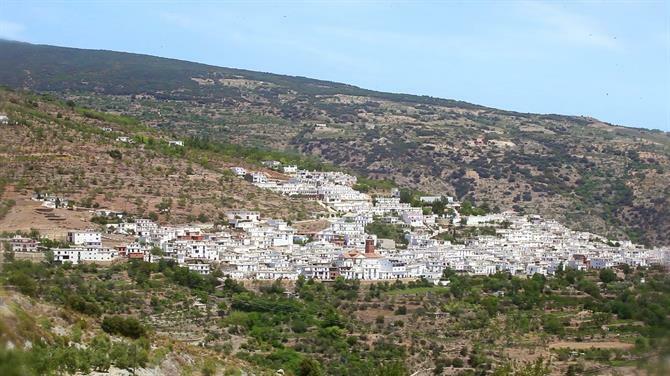 Take them to Soportújar in the Alpujarras, you won't hear another word! Would I like to visit an artisan chocolatier in a high mountain village just before Easter? I should cocoa...!